1966 was the first year for the High Country Special consisting of some GT special sports options but for the Colorado area which included a blue fender badge and came in Columbine Blue, Aspen Gold, or Timberline Green. 333 High Country Specials were produced and came in any body style, 6 cylinder or V8 engine, with wire or regular wheels, a special distinguishing emblem, and the unique paint color. 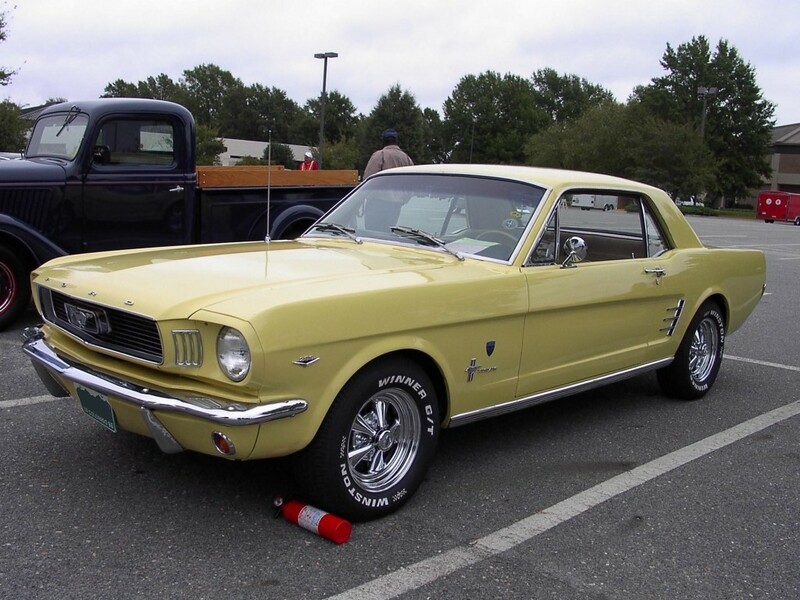 Aspen Gold 1966 Mustang High Country Special hardtop with High Country Special badge just behind the front tires and after market wheels. This color appears to be Aspen Gold (Ford MX #706815, Dupont 93-63705). The 1966 High Country Special only came in Timberline Green, Columbine Blue, and Aspen Gold. This car is available in 1024x768 pixel wallpaper, and 1280x1536 pixel wallpaper. 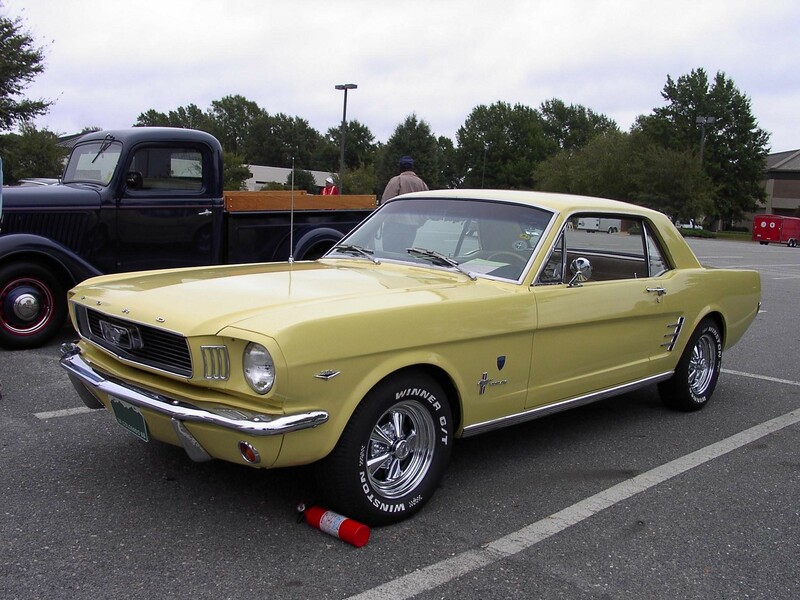 This is a restored Timberline Green 1966 Mustang High Country Special hardtop. The High Country Specials came in Timberline Green, Columbine Blue, and Aspen Gold. These same colors where on the 1967 High Country Special except the Ford paint code and Dupont paint code changed for Timberline Green. We are actively trying to get a paint chip of the two Timberline Green paints for comparison. Check this out! It's a Timberline Green 1966 Mustang High Country Special convertible. It's owned by Charles. It has the 289ci V8 engine and a manual transmission. The owner tells us, "I bought this car many years ago in Colorado (still has dealer emblem on trunk lid). It currently has about 26,000 original miles on it. It does come out every year for a couple church or Dairy Queen runs. I was surprised to see our car show up again on another site. If you research the 1966 HCS convertible you will notice that the same car is used on many sites as a reference model. Those pictures are about 15 years old. Other than a different set of tires and a couple thousand more miles she still looks the same. Not sure why or how everybody uses our pictures without permission but It's kind of cool seeing it pop up every now and then. I have amassed an extensive amount of detailed info on these 1966 HCS convertibles over the years and made a small book detailing the cars. I can provide info and extensive pictures if interested. After many years of turning down some pretty interesting offers for her the time may finally be at hand to let her go. I have had numerous Mustangs over the years, my personal favorite was a 1965 fastback in Tropical Turquoise of which only 50 were built before they switched the color. While owning that rare one I stumbled upon this one still owned by the original family. When a car this rare comes along you buy it and figure out what to do with it later. I brought it home but owned too many cars so I gave it to my father. Dad is now mid 70's and not driving much anymore and this car deserves to be somewhere else. I have 2 other convertibles and like to drive my cars. This one should not become a driver. There are only a couple of the 33-35 1966 HCS convertibles left and I know they don't have 26,000 miles. I had a big name restoring company wanting to restore it to concourse condition but they are only original once and this one should stay that way I think. I would be willing to entertain offers or ideas and can provide any and all detailed info as well as any pictures one might want. I will not be disclosing the location of the car publicly but will privately allow perspective buyers to come see her." This is a Columbine Blue 1966 High Country Special Mustang convertible. The High Country Special was a package similar to the GT sports package but offered in the Colorado area. It included an engine upgrade, metal rocker panel trim, steel styled wheels, and a High Country Special side emblem. The 1966 High Country Special was limited to three special colors: Timberline Green, Columbine Blue, and Aspen Gold.